Tuesday 13th December at Westbury Fields, Paul Foss will be treating us to a musical evening on the violinist, singer and composer Maestro Guglielmo Balfi (better known to us in the English speaking world as Michael William Balfe). He was a fascinating and talented man spending much of his working life in Italy and wrote a great deal of beautiful music much of which is sadly neglected. (with musical illustration). SEE 2016-17 PROGRAMME PAGE FOR DETAILS of January and later celebrated national speakers through to May. If you live near Cheltenham they also have a programme. 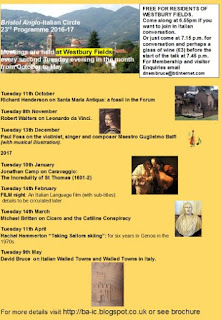 Bristol University Italian Department also has an open postgraduate seminar series.. - see Links Page . Meetings are at WESTBURY FIELDS RETIREMENT VILLAGE each 2nd Tuesday of the months October to May, at 7pm for conversation and a drink followed by the speaker at 7.30 p.m.